In case you're wondering its Tanya Burr Cosmetics Martha Moo on my lips! Blogosphere magazine is my inspiration, my ideal & my aspiration. 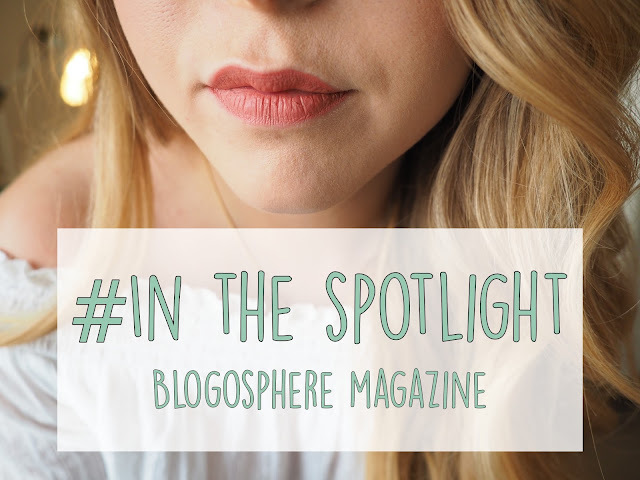 So you have no idea how shocked and happy I was to be featured in their #inthespotlight feature on their blog (Found here) amongst 9 other wonderful blogs. The lovely girls at Blogosphere chose us out of 113 entries! How crazy is that. "We were drawn to the clean design of Katie’s blog and really enjoy the mixture of fashion, beauty and lifestyle posts that she creates." They could even put me into Issue 10 of the magazine (the dream). I am an avid reader and love the publication, previously discussed here. The magazine has progressed so much even since I've been reading it. They recently added new sections which are a great read, I love discovering different genres of blogs. It's now time to up my game and get producing better & better content for you all. Thank you for reading this little blog, it may not be much but it means the absolute world when others like it.